Do you also like Crab and every other sea food available? Do you like Aapam, Puttu, and Parotta? Ok, ok, one final question- do you enjoy Kerala cuisine? If you answered YES to all or any of the above, then you can hop skip jump this post and head straight to Ente Keralam and enjoy their Kuttanadan food fest. No, there is no point in you going next week.Why? Because the fest ends on 11th Nov.
What is special? Well, there is an elderly couple who have come down from the Kuttanadan region and have designed the menu. The lady Mrs Mariam [forgot her surname] is such an adorable lady who loves food, and it shows in the way she talks. She sat next to me, spent a few minutes and literally rattled out all the recipes. I managed to understand most of it, and some missing pieces were fitted in by Chef Jaishankar [hope i got his name right] who was with Ente keralam. I ordered aapam which was served with mix veg stew and then i had the most divine dish called Pineapple Puttu, which was served alongside kadala curry[black chick peas]. The Aappam was sweet, while the puttu was yummilicious. It had pineapple juice and pieces, and melted in your mouth[ I infact told the chef to include pineapple puttu as part of their regular menu]. You dont need a curry for this dish. I also tried a few spoons of Ghee rice with Kadala curry and quite enjoyed it. The main fest was filled with Plenty of non veg dishes- ranging from karimeen moilee to prawn polichadhu and several other fish and chicken dishes. 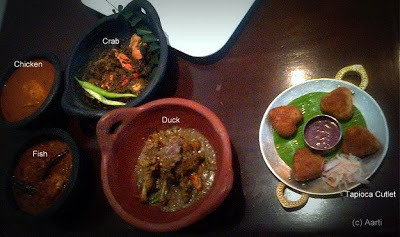 They also had a few duck based curries and one with Clam.The Chef said clam was not common here in Chennai and again it was an acquired taste. The desserts were not very impressive- I was served a plate with 2 small cups- one had ada pradaman [ a payasam with little pieces of jelly like things made with milk] and a jaggery based payasam[ milk, rice and jaggery]. Loved the latter, while the former was not really my thing. They also have a selection of ice creams and tender coconut payasam on their main menu which is available during this fest as well. The elderly couple came and spent some time talking to me, and she then sat next to me and said a prayer - thanking the Lord for bringing her to Chennai, introducing her to me and others, giving her the opportunity to show us what their world was like and prayed the Lord to take care of all of us and grant us all our wishes. I was so touched! She then said "I am going to go eat in the other room, you come sit with me if you want". What a sweet lady. The man remained silent. She mentioned she cooked to earn a living, while he cooked for friends, and in temples for free, as a service. I was served a glass of strong tea with cinnamon to help cleanse the palate and help digestion before I bid adieu to the team and the couple. Well, if you do visit Ente keralam before 11th, and are there for lunch, make sure to say a Hello this lovely couple. R A Puram Chennai 600028.